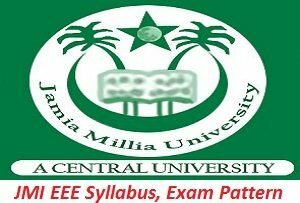 JMI EEE 2017 Syllabus: The applicants after filling the applicants from now they will need the syllabus to prepare them self for the engineering examination. Applicants must have to study hard to get admission in Jamia Millia Islamia University. Here applicants also get the JMI EEE Syllabus, Exam Pattern 2017 in this article down. Applicants should have to clear the Selection Process of JMI Engineering Entrance Exam 2017 to get admission JMI University. It is compulsory for all applicants to give this examination for admission. The conducting body of Jamia Millia Islamia Engineering Entrance Examination 2017 is Jamia Millia Islamia University for various engineering courses in undergraduate applicants. This examination is University level exam for undergraduate applicants. In JMI engineering entrance exam the question will be asked from the Mathematics, Physics and Chemistry subjects. With the JMI EEE Syllabus, 2017 applicants can score high marks in entrance examination. Following are the JMI Engineering Entrance Exam is as follows. With the exam pattern, applicants can score high marks in entrance examination. In exam pattern, applicants can see the wattage of each subject. The applicants can refer this exam pattern before giving the entrance examination. Following are the Exam Pattern of JMI EEE 2017 is as follows. Students must have to performance well in engineering entrance examination because applicants admission has totally depended on their entrance exam result. It is compulsory for all candidates to clear the Selection Process of JMI EEE 2017. The Merit list applicants are call out for admission process and a list will be the basis of applicant’s performance in the exam. Students will get all the fresh update of JMI EEE 2017 Syllabus and Exam Pattern in this article. For the admission in university, applicants need to clear the JMI EEE 2017 Selection Process. With this thinks, applicants can find out the weak subject point in exam and applicant can improve that weak point before entrance exam and score goods marks in the examination.